The Arctic sea ice has been surprising scientists for the last six years. It set a new record for melting back during the International Polar Year in 2007. Last year it beat that record, but at the same time the seasonal ice in the Bering Sea has been increasing – also to a record last winter. Whatever is driving these changes is also beginning to affect the vegetation on land. The University of Alaska Fairbanks Institute of Arctic Biology set up a series of test plots along the Dalton Highway and north, for the International Polar Year, hopping islands into the Canadian Arctic. This summer, permafrost researcher Vladimir Romanofsky went out to check them. The line of plots ends at Ellef Regnes Island, less than 10 degrees below the North Pole. Biologist Skip Walker could hardly believe what Romanofsky sent back. What Romanofsky saw and what will be reported at a scientific meeting in December, is permafrost melting and slumping, in a place that is normally frozen year round. The sea ice was not sufficient this summer to keep the air above the test plots from warming up. 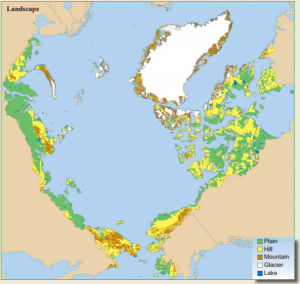 What that means for a whole category of plant life on land that needs year round ice to exist is largely a matter of speculation. Skip Walker is one of the authors of a report published last month in Science magazine that seeks to survey the impacts on land of less ice in the sea. He says the picture is not going to be as simple as less ice leading to more warmth and more vegetation. Satellite imagery that can basically read the amount of plant material on the ground is not showing such a simple response. And temperatures in some areas are for some reason no longer continuing to rise as more sea ice is lost. It’s a big mystery right now. UAF atmospheric scientist Uma Bhatt is another co-author of the article. She and Walker are seeing reduced vegetation, less green-ness and more brown-ness. Along with Russia it’s happening along the Alaska coast of the Bering Sea. “There seems to be a decline in greening and there’s been a decline in warming in the summer, and we think it’s related to cloudiness, but that’s our next paper to figure that out,” Bhatt said. Both collaborators have noticed that the browning correlates with the way the sea ice has been disappearing from the Bering Sea later in recent years. 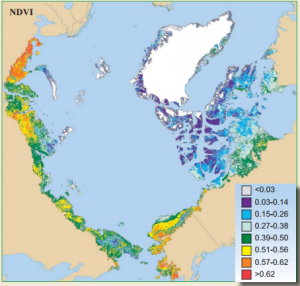 “So the vegetation has not become more productive in that area, but we don’t know if it’s related to the sea ice, because the sea ice is gone before things green up in that part, because it’s so far south,” Bhatt said. For more than a decade now, nearly all the changes hitting the Arctic due to reduced sea ice have added up to warming effects exceeding anything the computer models have predicted. The warming has fed more warming as positive feedbacks have been stronger than predicted – warmer waters circulating under the ice, more heat stored by increased vegetative growth and a darker ocean all feeding yet more warming. But, the browning begins to look like a negative feedback, and Bhatt says some recently observed changes in sea ice do, too. It’s all frontier science – new observations demanding new theoretical explanations. The negative feedbacks, while intriguing, remain greatly outweighed by the positive ones, but they no doubt complicate things for the computer modelers and give them some new material to try to integrate.